For me, these two quotes best encapsulate the intrigue and audacity of Michael Powell and his cinema. Ever since the pleasure of first viewing Black Narcissus (1947) on a borrowed VHS tape, Powell became one of my favourite directors. I love his films for their moments of sublime visual and poetic beauty; the use of colour or other cinematic devices to produce psychological ruptures within the texts; their strong women and the “journeys” they are subjected to and ultimately transcend (often to disturbing ends); their evocative portrayal of place; their palpable moments of nostalgia; and the moments where Powell’s (and presumably Pressburger’s) impish sense of humour shine through visual puns and succinct, witty dialogue. But most of all, I love Powell’s films for their assured style and deft forays into an “imagining” of his characters’ worlds. The Red Shoes is no exception to this. As a director, Powell’s career was prolific and long-lived precisely because he was never shy of trying different genres, cinematic styles and techniques, and perhaps most telling of all, he was willing to rise to the challenge of working within confined production budgets with different producers in order to get his pictures made, yet all the while, leaving his unique indelible stamp on the finished product. His career ranged across five decades. His beguiling and peculiarly very British films beginning to be reappraised in the 1960s and 1970s by the American “movie brats” – Scorsese, Coppola, Spielberg and De Palma – as well as British film critics and scholars like Raymond Durgnat and Ian Christie. Such accolades led to re-releases and retrospectives of his oeuvre, ultimately leading to Powell’s instalment in the pantheon of world cinema’s greatest directors. The Red Shoes was a landmark dance film because it was the first film to transcend dance’s theatricality and move into “pure cinema”. As a mise-en-abyme, the film’s structure and production provided a concrete example of how films about dance productions could be interpreted more evocatively. It gave rise to countless musicals, most notably the various Gene Kelly/Vincente Minnelli/Stanley Donen musicals An American in Paris (1951), Singin’ in the Rain (1952) and The Band Wagon (starring Fred Astaire, 1953). As Ian Christie has stated, “Before The Red Shoes, there were films with dance numbers. After it, there was a new medium which combined dance, design and music in a dreamlike spectacle.” (3) The fact that Gene Kelly screened the film numerous times for MGM executives in order to get An American in Paris green lit, is testament to The Red Shoes‘ brilliance. However, at its first closed screening, The Red Shoes was despised by Rank Organisation executives who heavily backed it at a time when government quota requirements for British cinema were at an all time high due to an embargo placed upon the importation of American films (4). Coming in at roughly 100% over budget, they considered the ending of this adaptation of a Hans Christian Andersen story too gruesome and nihilistic in the stiff upper-lipped era of postwar rations and gritty cinematic realism; in short, as something very un-British and un-fairytale-like. Just like The Life and Death of Colonel Blimp (1943), it was received as an unexpected “sustained assault on good manners and good taste” (5). According to crew members present at the Rank screening, the executives did not bother to hide their contempt for the picture. In an unprecedented gesture, they rose from their seats and left in silence. Anticipating a public backlash, Rank denied The Red Shoes a premiere and theatrical posters for its first UK release were never produced. The film played at a West End cinema for ten days before going into a short-lived limited general release (6). However, most of the immediate critical reception of the film in the UK, and later abroad, suggests that the Rank executives had a myopic, ultra-conservative view of its product and its independent production company, The Archers. For instance, Picturegoer called it, “an uncommonly beautiful film […] one that you certainly should not miss, even if you are one of those who say ‘Ballet bores me’. The Archers, always enterprising, once again have broken new ground. […] In sensitively used Technicolor, marred only by some daubs of blood in the closing scenes, it provides a feast of beauty and some fine acting.” (7) Supposedly, even the Royal Family greatly appreciated the film despite its ending. After a private screening at Alexander Korda’s house in London, the young Princesses Elizabeth and Margaret were said to have been, “all devastated by the ending of the picture, […] and thanked him with tears streaming down their faces for showing them ‘such a lovely – boohoo! – picture’” (8). Yet perhaps it was precisely this cinematic rendering of “emotion” and “passion” in The Red Shoes that divided audiences. It seems that those with either a lack of romanticism or more familiarity with the “high art” of ballet and its milieu, view the film as a series of ill-informed pretensions bearing no realistic resemblance to the discipline of dance or life. Pauline Kael was a notable figure within this school of thought, citing the film as, “Blubbery and self-conscious [… by] master purveyors of high kitsch” (11). To dismiss the film in this way, totally overlooks the film’s intentions and its context of production, for as Powell once stated in an interview in his later years, he believes the film’s success lay in the fact that “we had all been told for ten years to go out and die for freedom and democracy, for this and for that, and now the war was over, The Red Shoes told us to go out and die for art” (12). The problematic figures of the impresario Boris Lermontov, mirrored in real life by Powell, has sparked similar obsessive ambition in future directors including Coppola and Scorsese, who saw The Red Shoes as children. Ultimately, it is Powell’s cinematic preoccupation with his (re)presentations of Moira Shearer as ballerina, daughter, dutiful and loving wife, that fascinates and haunts me. Repeatedly moulding her under various points of view, these sublime yet troubling moments abound throughout the film and are all the more exquisite because they also speak of her imminent doom. Today, The Red Shoes remains not just a visually stunning and complex film about art, ambition and libidinous desires, it is also intoxicating as a disturbing exploration, from a man’s point-of-view, of what it might mean to be a “modern” woman, trapped between a lifetime of individualistic career ambitions and the desire for a contented home-life as a wife and mother. Raymond Durgnat, “The Powell and Pressburger Mystery”, Cineaste vol. 23, no. 2, 1997, p. 16. Powell quoted in Ian Christie, “Chronicle”, Powell, Pressburger and Others, ed. Ian Christie, BFI, London, 1978, p.59. Ian Christie, “The Red Shoes”, The Criterion Collection. For further information, see Ian Christie (ed. ), Powell, Pressburger and Others, pp. 35–37. Ian Christie, Arrows of Desire: The Films of Michael Powell and Emeric Pressburger, Faber and Faber, London and Boston, 1994, pp. 5–6. They organised a midnight screening to a limited number of invited guests instead. (Reviewer unknown), “The Red Shoes”, Picture Goer 28 August 1948, quoted in The Powell and Pressburger Pages. As related by Powell in Michael Powell, A Life in Movies: An Autobiography, Heinemann, London, 1986, p. 651. Powell, A Life in Movies: An Autobiography, pp. 654–655. 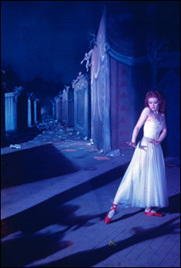 See also “A Profile of The Red Shoes Documentary”, The Red Shoes DVD, Carlton International Media, 2000. Bosley Crowther, “The Red Shoes”, New York Times 23 October 23 1948, quoted in The Powell and Pressburger Pages. Pauline Kael, from 5001 Nights at the Movies, The Powell and Pressburger Pages. Powell in Christie, Arrows of Desire, p. 9. Karli Lukas is Assistant Curator of the Melbourne Cinémathèque, an independent filmmaker and works in the Media and Cinema Studies department at RMIT University, Melbourne.